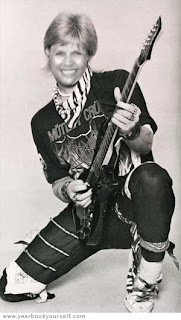 Goodbye, scary 80s rocker Renée picture! Where's my pride? I can't believe I've had that guitar picture up there for so long. Although, I guess it's not gone for good, but at least it's not still at the top of the page! Anywho, things are fine. I'm moving along with everything Dreaming of Deliverance-related. The print version is close. The first podiobook episode should be released before too long. I'll have a web site within the month. Right now I'm trying to figure out how to get DOD on Kindle. That's proving to be somewhat tricky! As for Unpublishednotdead, I have no idea what's going on with it. Eric/Kael has been quiet lately. I'm hoping there will be something new there soon, though. School started last week and I've already subbed twice. So life is typically busy, but what else is new? Sometimes it's not a good idea to return to the past. Okay, I never really looked like that. I've been playing with Yearbook Yourself 2009. Although, my sister has some pretty scary photos of me from the 80s, the era of big hair, that I'm hoping she burns soon. It wasn't a flattering decade. Anyway, I'm back at the Community of Writers at Squaw Valley, and it's cool, but kind of weird too. I'm not doing the workshop this year and I like that I can attend the panel discussions, and craft talks without the pressure of giving feedback and the worry about my own writing being critiqued. But at the same time, it's odd to be here, but not one of the participants. In some ways it's exactly the same as it was last year. I see all of the same kinds of people (including my type--horrifying as that is) but I'm looking at it from the outside, instead of experiencing it from within. Okay, that sounds bizarre. And I don't think it was a mistake to come here, like a mullet and Crue t-shirt would be a mistake. But it is...strange. I must think more on this!